Detailed in a combined release notes webpage for current Office for Mac apps, the latest Insider Fast builds are considered previews of the "next major version" of Microsoft's app suite. The latest releases incorporate a number of highly requested features, new additions and bug fixes for Word, Excel, Outlook and PowerPoint. As expected, most upgrades impact users with Office 365 subscriptions, Microsoft's cloud-based productivity solution. Starting with Word, Office 365 subscribers will benefit from a new AutoSave feature when working with OneDrive and SharePoint files, which automatically saves documents as users work. The function is similar to other auto-save products like Google Docs, and can be deactivated in program settings. Also new for Word is real-time collaboration and sharing. Office 365 subscribers can co-author OneDrive and SharePoint files with other users, while new options streamline the process of sharing OneDrive for Business and SharePoint files with colleagues. Finally, Microsoft is adding a series of new chart types for embedding in Word documents, including Waterfall, Histogram, Pareto, Box & Whisker, Treemap and Sunburst. The company touts the charts as designed to enable quick visualization of common financial, statistical and hierarchical data. Microsoft's Excel spreadsheet tool benefits from collaborative features similar to those built into Word, meaning users can simultaneously edit workbooks stored in OneDrive and SharePoint. The app also gets access to the same new chart types mentioned above. Specific to Excel are new IFS and SWITCH functions, which simplify and shorten spreadsheet formulas. The Insider Fast build includes better support for charts with PivotTable data sources, as well as Table Slicers for quick filtering. Microsoft is bringing its Mac iteration in line with Widows with updated Visual Basic for Applications (VBA), though not all object models are supported at this time. PowerPoint comes with a raft of upgrades, including real-time collaboration, document change and revision tracking, auto-save and more. QuickStarter, which leverages the Bing Knowledge graph to build a presentation outline on specified subject mater, is now available for Mac, as is Trim Media, which allows users to cut unwanted content from the beginning and end of inserted audio and video clips. PowerPoint Designer on Mac adds additional triggers and layouts to match the full functionality of its Windows counterpart. Moving on to Outlook, the email management tool receives a modest update with emoji support when composing messages. Microsoft's OneNote, did not receive a new Insider Fast build on Monday, suggesting only minor changes are in store for the digital note taking tool. 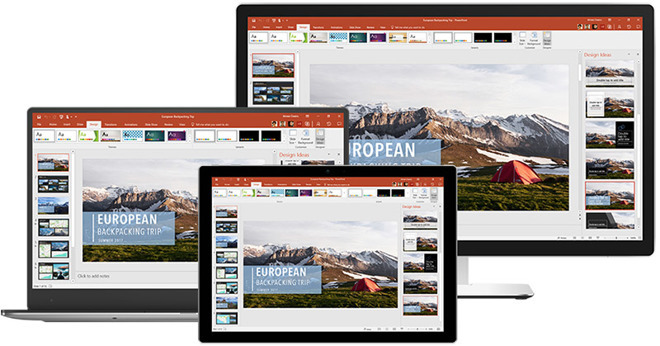 When Microsoft plans to roll out the major Office 2016 for Mac update is unclear, though a rapid Insider Fast build release schedule suggests public availability is imminent.